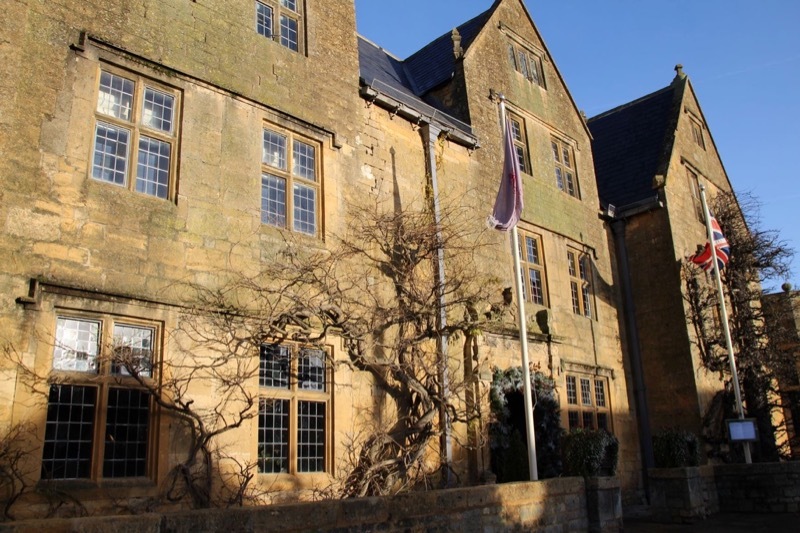 Set in the charming village of Broadway, this forming coaching inn dates back to medieval times. 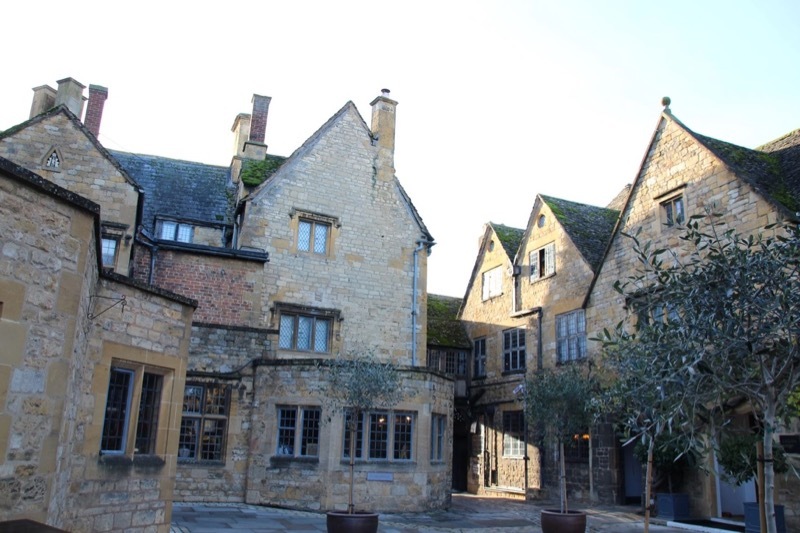 During the English Civil War both Oliver Cromwell and Charles I stayed here, (though not at the same time)! 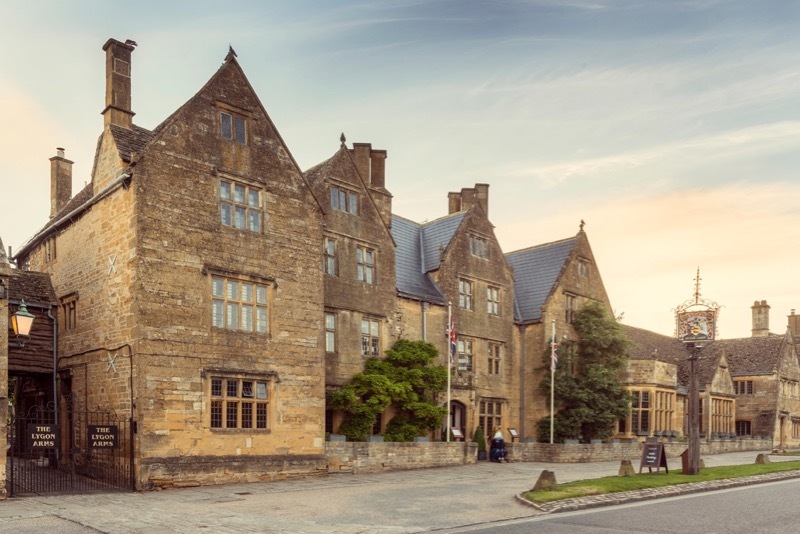 Today the Lygon Arms is a beautiful bolthole for couples and families who want to explore the Cotswolds in style. 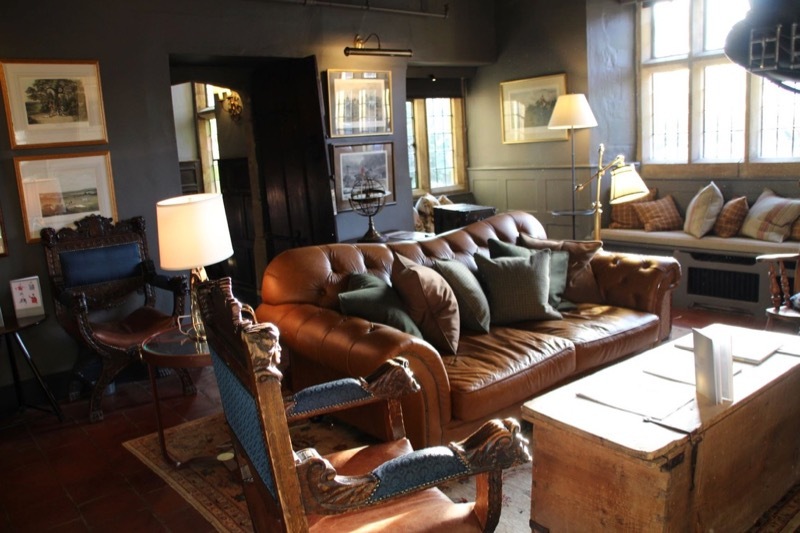 Not long refurbished, Lygon Arms masterfully balances the old with the new. 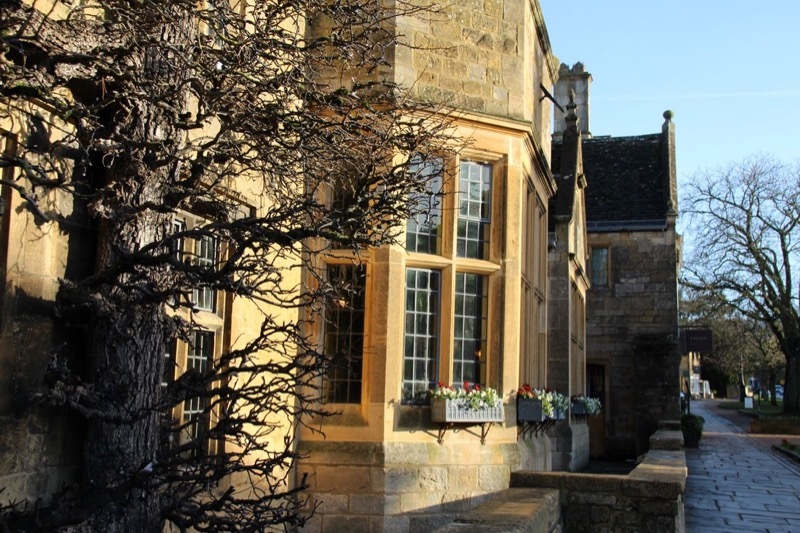 In the original building you’ll find antique features at every turn including thick stone walls, imposing fireplaces and attractive mullioned windows. 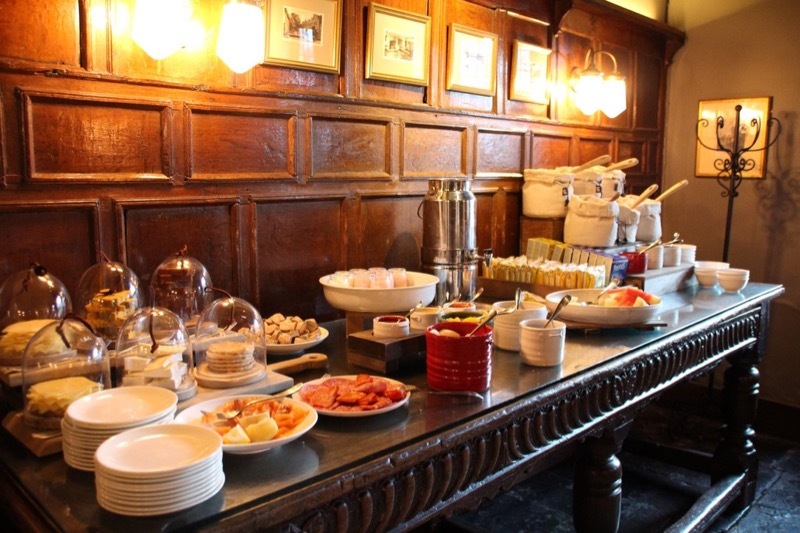 The layout, too, has a historic feel about it and I delighted in exploring the warren of cosy lounges where you can take tea and peruse the morning papers in peace. The staff we encountered were also experts at balance, both informative yet friendly. 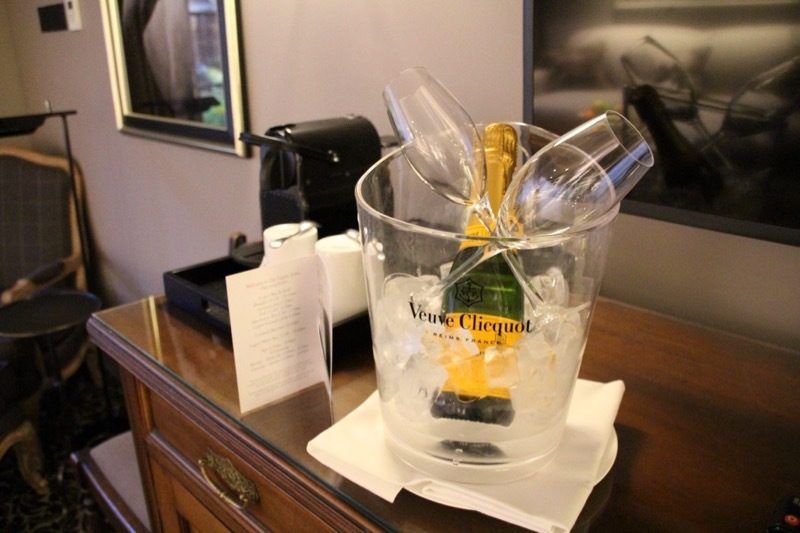 And not once did the hotel feel stuffy or overtly formal; there was a jovial atmosphere throughout, no doubt buoyed by December festivities. Speaking of which, the decorations were magnificent. We arrived earlier than check-in time, but reception happily stored our bags. We then whiled away an hour in the pleasant Lygon Wine Bar, before returning to check-in. A friendly member of staff showed us to the room and concisely explained how things worked at Lygon. During the revamp, several new suites were added to the hotel resulting in a total of 86 rooms. While 36 of them are in the main building, the rest are in the pretty Orchard, Garden and Courtyard wings. 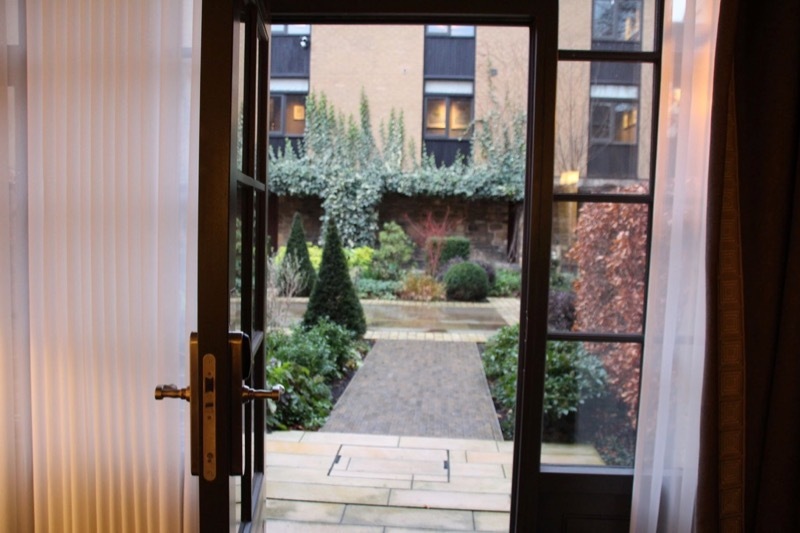 We stayed in a junior courtyard suite and I would not hesitate to recommend it. 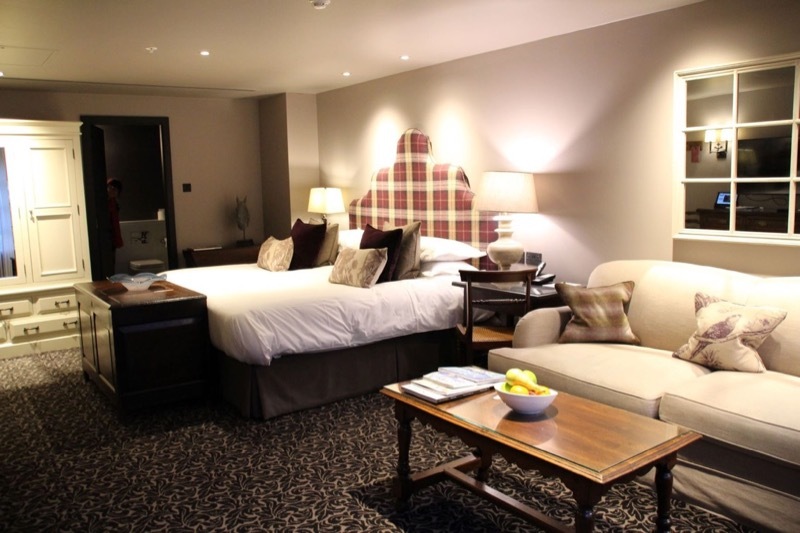 The king bed was as sprawling as it was decadent and I fell in love with the tartan headboard, the perfect balance of countryside and chic. The sitting area was a great space and I imagine would be hugely useful for holidaying families. 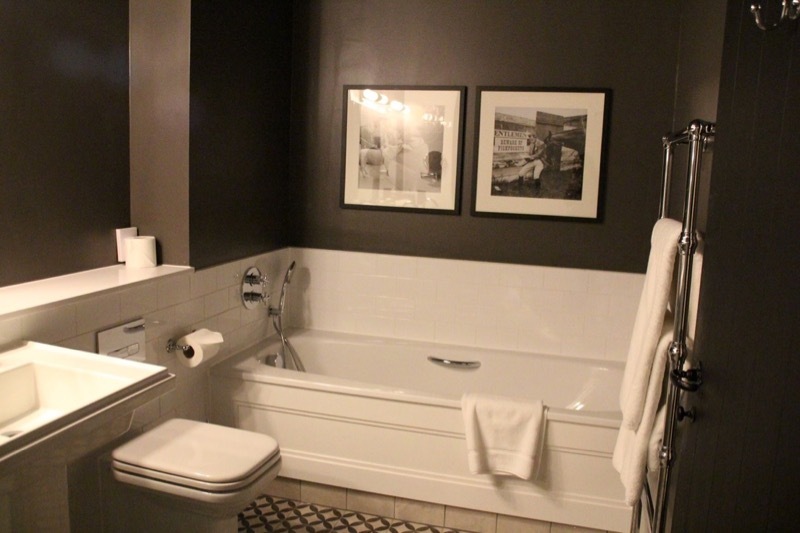 As would the bathrooms for that matter, which featured twin sinks, a walk in-shower and a lovely bath to boot. All visitors enjoy free Wi-Fi, tablets bursting with hotel info, Nespresso coffee machines and complimentary soft drinks in the mini fridge. 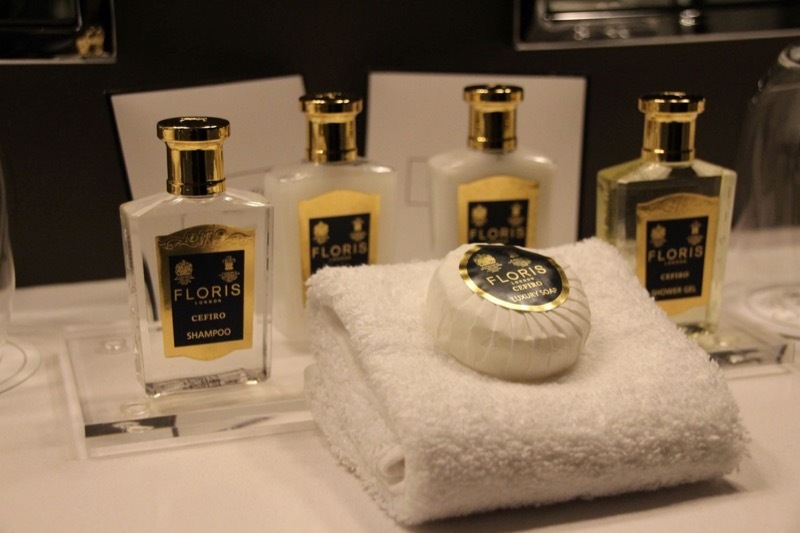 The robes and Floris toiletries were a lovely touch, as were the smart antique furnishings. 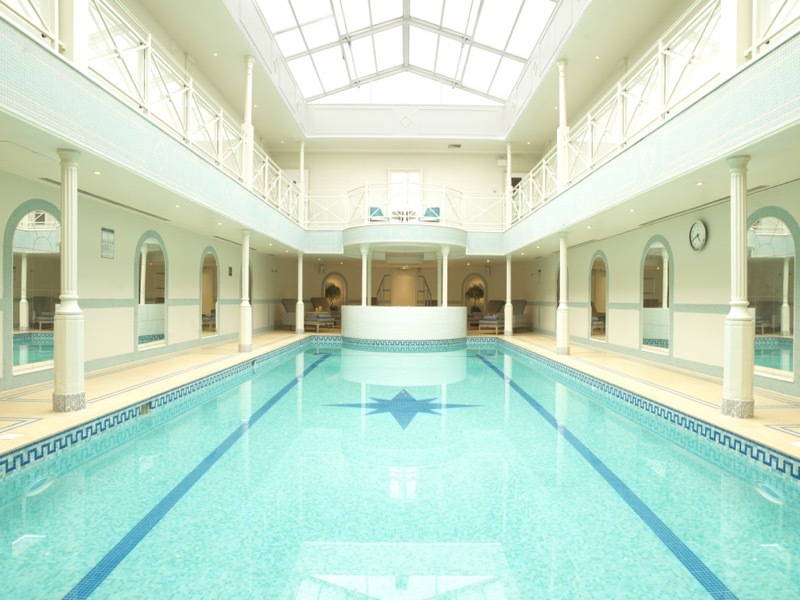 The spa here is home to seven treatment rooms, a 13m pool, a spa bath, steam room and saunas. There is also a gym, nail studio and spa café. I loved the unapologetically ostentatious design of the spa with its metal pillars supporting a raised walkway. There was even a retractable glass roof, though in December it’s fair to stay it stayed firmly on! I can imagine it is a wonderful light-filled space come spring. But on a cold December evening it was the perfect place to warm up. We spent plenty of time doing just that in jacuzzi and I also enjoyed a very restorative 60-minute full body massage. I would heartily recommend both! We had a dinner reservation at the Lygon Bar and Grill at 7pm and arrived to find it buzzing with fellow diners enjoying the festive atmosphere and tucking into plates of classic dishes. 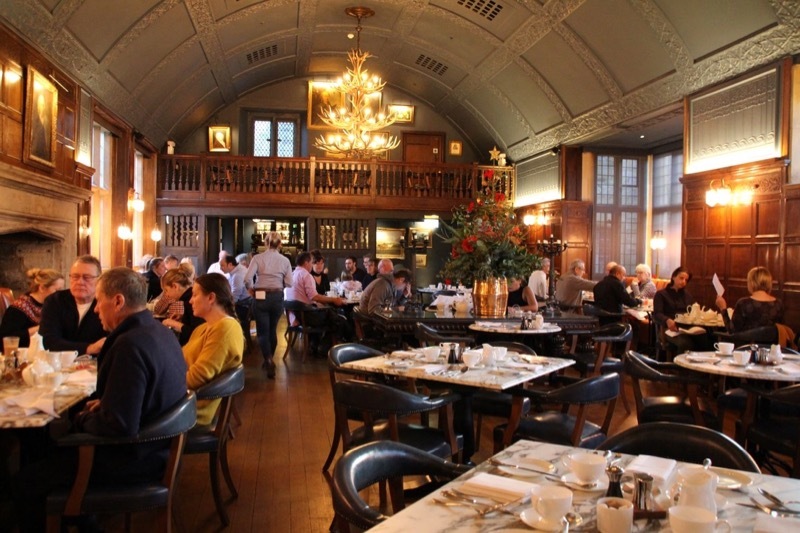 The street-facing restaurant boasts a stunning barrel-vaulted ceiling, an epic gallery wall of portraits and decadent wooden panelling. Yet it’s blended perfectly with bang up-to-date touches throughout; the marbled tables, slick navy chairs and statement chandelier all bring the dining room into the 21st century and the result is stunning. 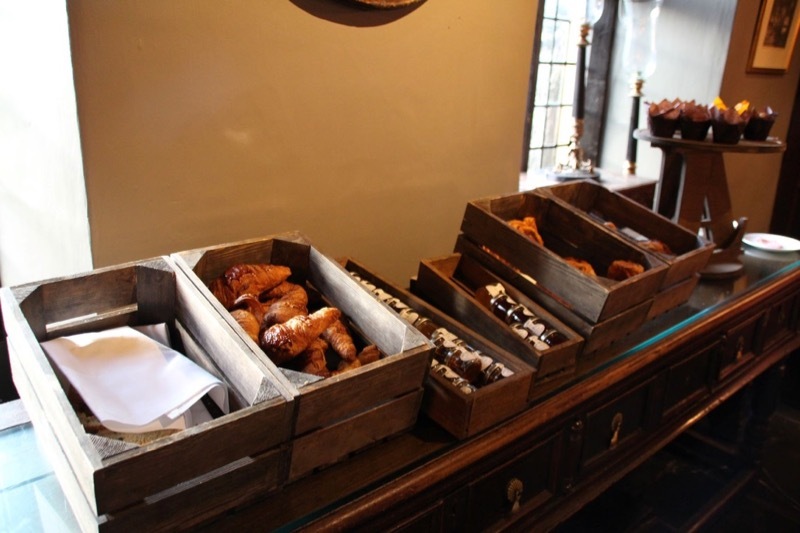 Here the vibe is relaxed and the food is modern British with a focus on all things local. If you fancy a drink before you dine, check out the separate cocktail bar or head next door to the Lygon Wine Bar for Italian wine and a nibble. The main menu was full of meaty classics like chateaubriand steak and veal, but we opted for the vegan menu which I was delighted to discover had multiple options for each course. 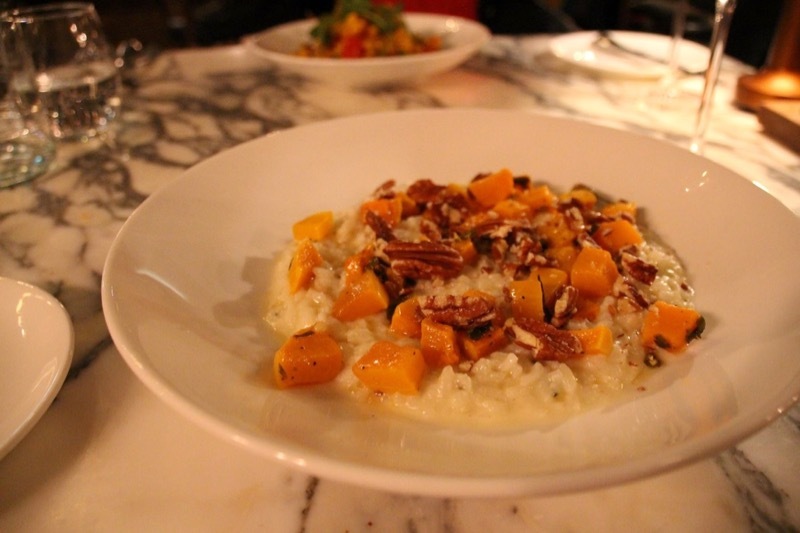 To start with I had the butternut squash and spinach risotto which came drizzled with walnut oil and a sprinkling of chopped nuts. It was a hearty dish full of moreish umami flavours. My dining partner went for the pearl cous cous dish which was served with Badsey squash, spicy peppers and rocket. 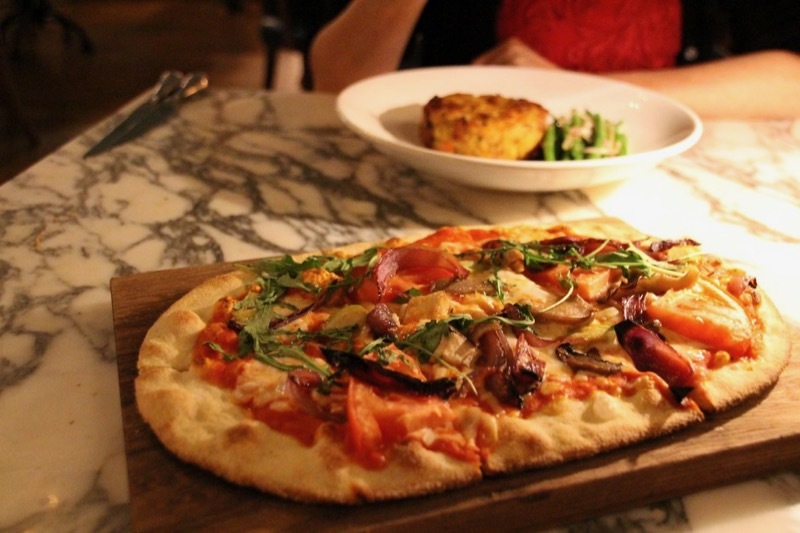 For my main I couldn’t resist the vine tomato, roast pepper and black olive pizza, which paired beautifully with the Chianti I was drinking. 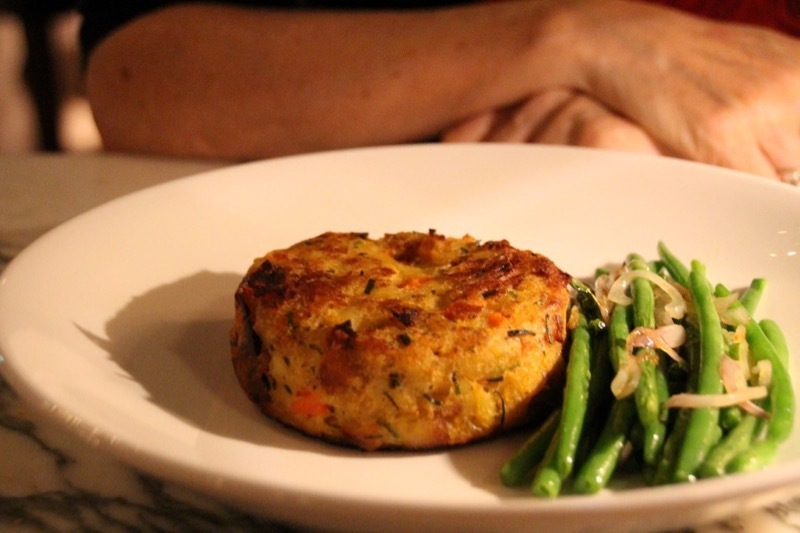 My dining partner ordered the bubble and squeak with fine beans and shallots, which was a smart twist on an old classic. We were, regrettably, too full for pudding, but there were plenty of vegan options including a delicious sounding treacle and apple tart I am currently regretting not ordering. The next morning we enjoyed breakfast, which is also served in the main restaurant. Guests can choose from a tempting buffet spread of French pastries, a variety of cheese and charcuterie and yoghurt with stewed fruit. There is a separate menu of fresh cooked dishes which you can also order from. 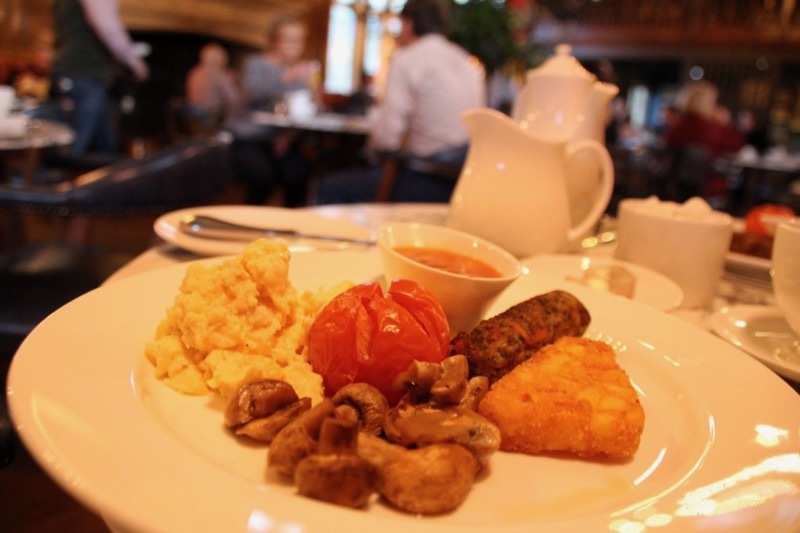 We opted for the vegetarian breakfast, which filled us up until way past lunch time. 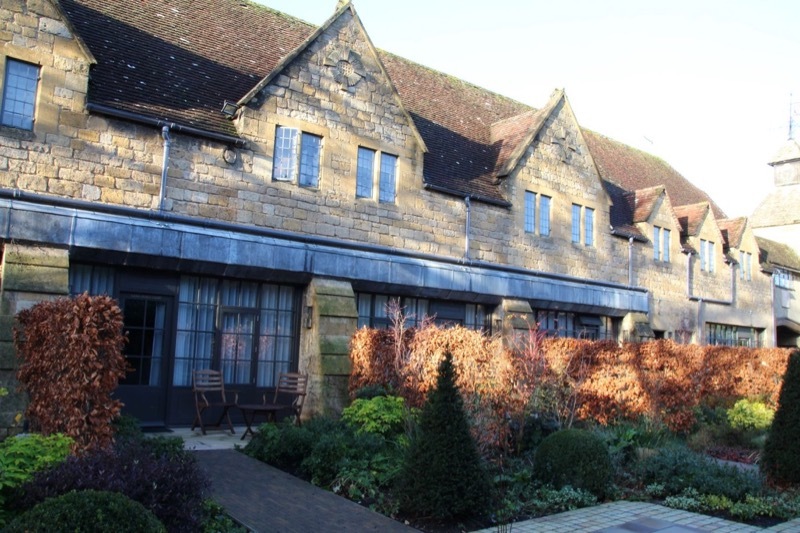 Combining historic charm with stylish design and impressive facilities, this warm and welcoming property is an excellent choice if you are looking for a faultless base to explore the Cotswolds. Likewise, it would be the perfect spot for simply kicking back and relaxing in style for a few days.